At Chad’s Carpet Care, we are committed to helping you protect your furniture and upholstery. Our commitment to providing the best solutions we can to our customers means taking advantage of any technologies we can that provide benefits to our clients. Teflon upholstery protection is one such technology. Providing significant stain protection to all of your upholstery, Teflon protection is one of our favorite ways to help our customers keep their furniture stain free. Our company is obviously enthusiastic about regular, consistent upholstery cleaning. We know that regular professional cleaning protects your furniture from degradation and keeps it looking and feeling great. But what about the time between each cleaning? What about all the accidents that can happen, that seem almost guaranteed to happen, right after you get your furniture cleaned? For the unexpected, there is Teflon upholstery protection. When Teflon coatings came out for cookware, it was a revolution. All the sudden the long, hard struggle to keep food from sticking while cooking – and the hassle of scrubbing endlessly to remove stuck food – was over. Now non-stick cookware is in every home, making life easier and cooking more enjoyable. While there are some obvious differences between the Teflon in your cooking pan and the Teflon we apply to your furniture, the comparison makes it easy to understand why this type of upholstery protection is so amazing. We apply it to your upholstery and you can see dirt and other substances that would normally soak in just slide right off. Teflon fabric protector makes cleaning furniture so much easier, even vacuuming. The fabric protector repels both dirt and liquids, so when an accident does happen, you can more easily take care of the problem yourself. Usually you can just vacuum up the dirt or wipe up the liquid and go about your business. No scrubbing, no worries about staining. One of the most difficult substances to get out of a fabric material is oil. 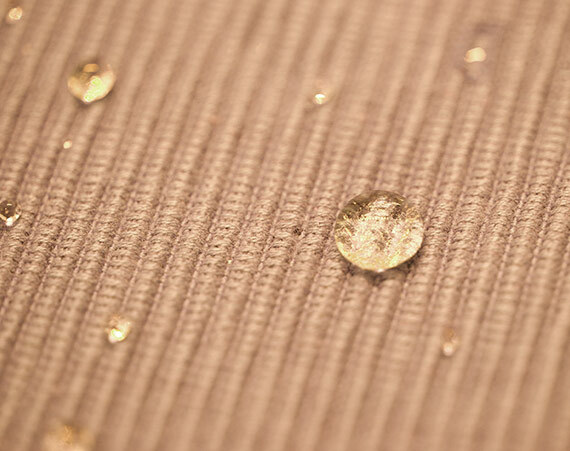 Not only does fabric protector repel water-based stains like wine, it also repels oil-based stains as well. So when the kids drop a slice of pepperoni pizza on the couch, you are still protected. Fruit drinks or fried chicken, your furniture is protected. Teflon fabric protector makes cleaning upholstery a breeze. Even if something does manage to stain your upholstery, the Teflon coating will often make it easier to remove with professional cleaning. Nothing lasts forever, not even Teflon fabric protector. If your furniture came coated with a fabric protector, or you have had fabric protector applied before, it sill still wear off over time. Regular use and professional cleaning will strip away the fabric protector, so it must be reapplied periodically. If you would like to have your upholstery cleaned and have Teflon fabric protector applied, please contact us. We can help you get your furniture looking bright and clean, and make sure it stays that way with a professional application of Teflon upholstery protection.